Microsoft has announced a new set of VM sizes for Azure Virtual Machines, known as the D-series, that have faster vCPUs (compared to their older A-series Azure VMs) and local, temporary SSDs. These local SSDs are touted as being good locations to use the new Buffer Pool Extensions (BPE) feature that was added to SQL Server 2014, for both Standard Edition and Enterprise Edition. 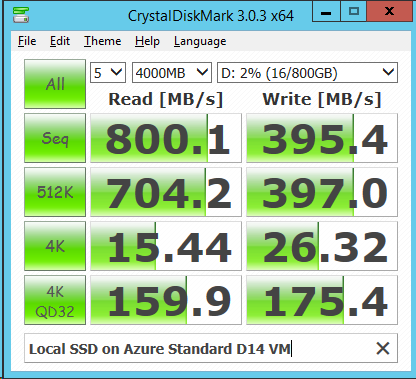 The size of this local SSD ranges from 50GB to 800GB, depending on what size Azure VM you have. Microsoft has a small text file on the root of this temporary SSD, as shown in Figure 1. I have only created one D-series Azure VM so far, which is a Standard D1 in the U.S. South Central data center, so my sample size is extremely small. My little Standard D1 VM has an Intel Xeon E5-2660 processor in the host (see Figure 2). 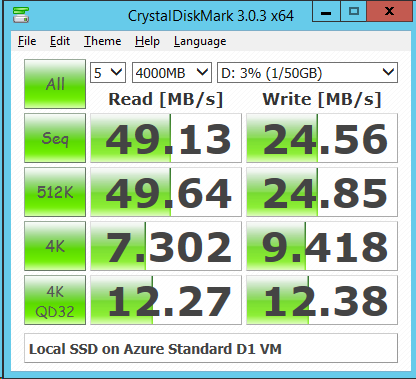 I ran a single, five-pass CrystalDiskMark test run on the 50GB, temporary SSD on the smallest Standard D1 Azure VM, which is shown in Figure 3. These are not very impressive results for an SSD. This is the smallest D1 VM available. I am guessing that these local SSDs are shared across multiple VMs on a host. Perhaps Microsoft is using something to throttle the I/O performance of an individual VM to get a guaranteed level of performance? I will need to run some more I/O testing before I draw any lasting conclusions here. Update: After some interesting conversation on Twitter, I ran the same benchmark on a “top-of-the-line” Standard D14 Azure VM, as shown in Figure 4. These are dramatically better results. As I said originally, this subject bears more investigation and testing before we jump to any conclusions. This entry was posted in Azure Virtual Machines and tagged Azure Standard D1, Azure VM. Bookmark the permalink.